Northern Irelands Leon Reid shows off his historic bronze - Northern Ireland’s first athletics medal at the Commonwealth Games in 28 years. 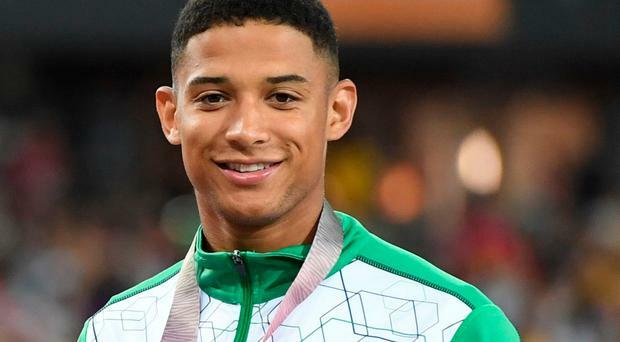 Northern Ireland's first athletics medal winner at the Commonwealth Games for 28 years will likely have to wait until July to find out if he can represent Ireland. Leon Reid brought home bronze in the 200m on the Gold Coast, but his application to switch allegiance from Great Britain to Ireland may be put on hold until the IAAF settle their international transfer debate. The governing body suspended all transfers last year in order to review the process after it was recommended there be a "minimum three-year waiting period before an athlete may transfer to represent another member". The decision was also made due to the number of African athletes changing their allegiances to countries such as Qatar, Bahrain and Turkey. The 23-year-old wants to switch to represent Ireland in honour of his late mother, who was from Belfast, while his adopted mother is from County Wexford, meaning he has very strong and current ties in Ireland. The sprinter is based in Bath and hasn't represented Britain since the European Under-23 Championships in 2015. That means if the IAAF agree his three-year transition period started after that event then he would be eligible to represent Ireland in August's European Championships in Berlin. Last July, Reid wrote an open letter to IAAF president Lord Sebastian Coe in an attempt to try and represent Ireland at the World Championships, however that plea was rejected. Commonwealth Games gold medallist Rhys McClenaghan has been granted permission to train in Dublin by Sport Ireland and Gymnastics Ireland. Commonwealth Games heroes, including Northern Ireland's golden boy Rhys McClenaghan, have been given a warm reception at 10 Downing Street. By Declan Bogue NI’s most decorated Commonwealth Games competitor, airman David Calvert, on how he plans to be still flying high at 75, despite perceptions he feels are unfair to his passion.